I know it's been a long time-- I have so many posts to write, and so little time! I'm hoping that life will calm down a little so that I can share more with you in the near future. 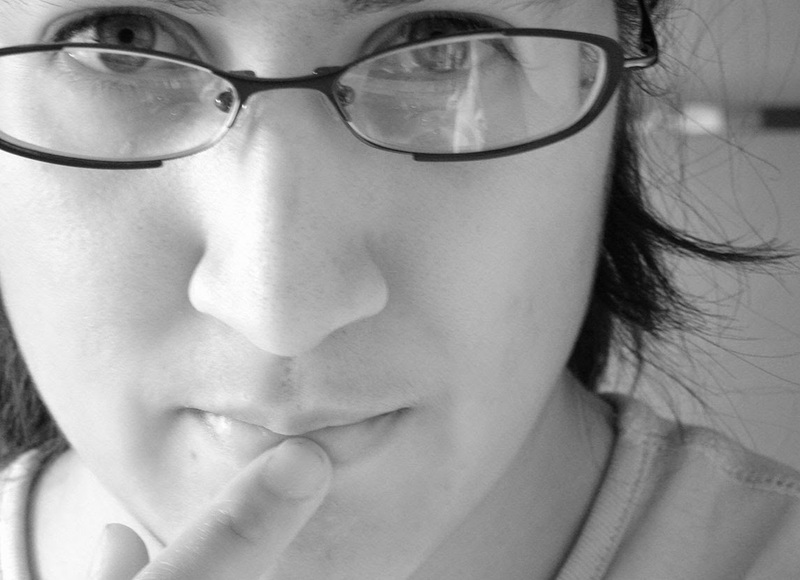 Today I have an extra-special post with an exciting giveaway at the end! 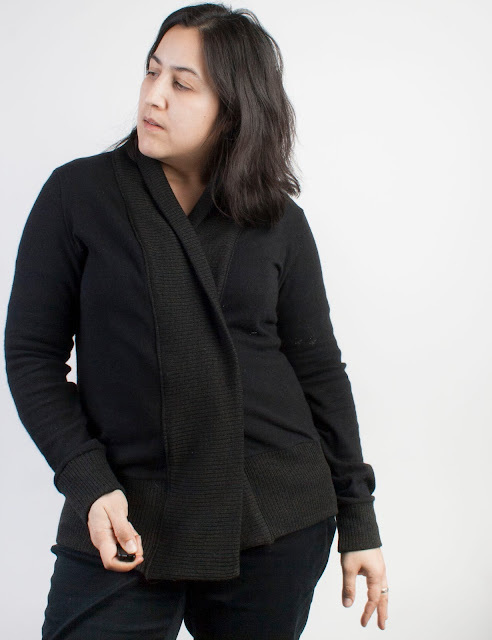 I'm currently really enjoying the Blackwood Cardigan by Helen's Closet. To be truthful, I've been waiting for the right cardigan pattern to come along. 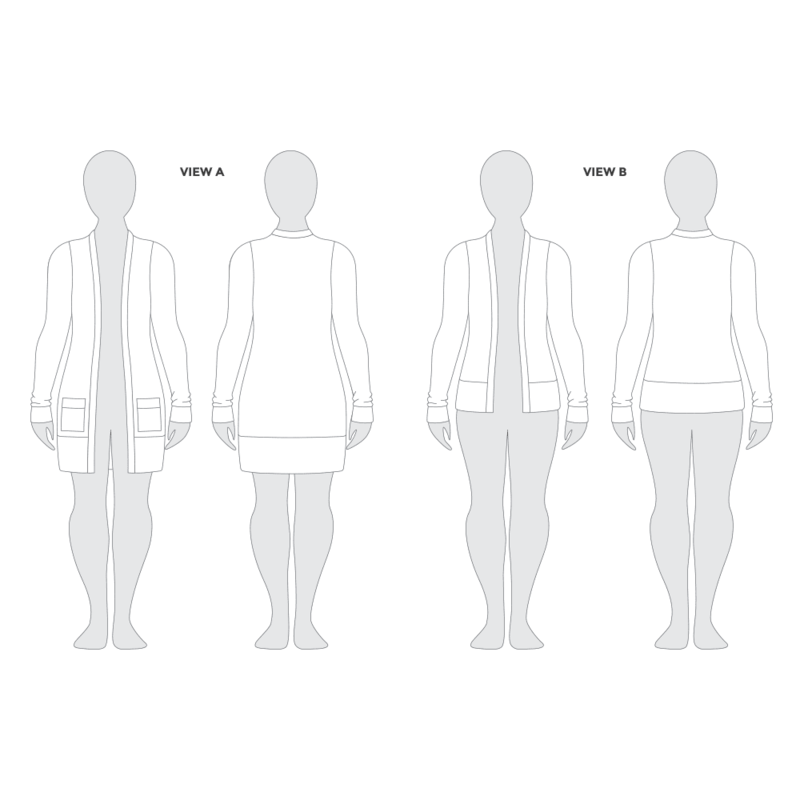 I have a trusty cardigan pattern that I pull out when I need a new one, but it is basically a poor attempt tracing a favorite cardigan, and the fit has always been just a bit sloppy and I've been too lazy to fix it. I was a pattern tester for the Blackwood. 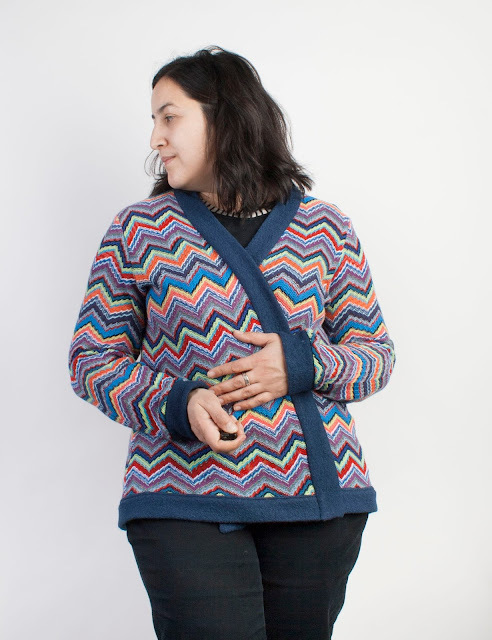 When Helen revealed that her new pattern was a cardigan, I was thrilled-- it's just what I was looking for! I also have a few other favorites from Indie designers that fit certain needs. 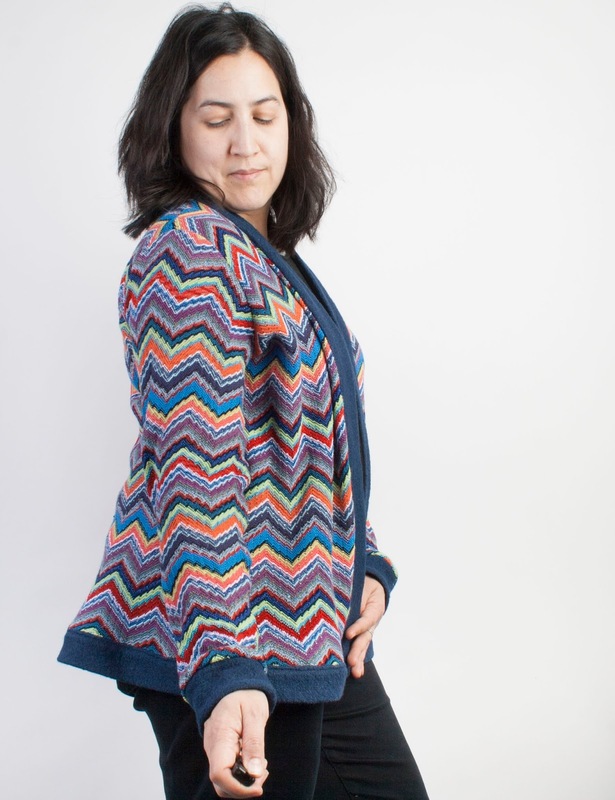 The Coppelia Cardigan by Papercut Patterns is a cozy wrap design (I've blogged that here and I have another one that I love even more in a simple merino knit that I apparently never blogged). For a classic button front cardigan there is the Lisbon Cardigan by Itch to Stitch (see mine here). What's nice about the Blackwood is that it is a simple, no closure design. It is designed to fit closely, and has cuffs, a neck band and a bottom band, so you can sew the entire thing on a serger. This is the line drawing from the pattern, so you can see it is a pretty straightforward design, with a long and a short view. My first version is View B, unaltered except to shorten the sleeves by one inch. It's a little longer on me than in the drawings, probably because I'm 5'4", but I like the extra length. I made this one in a stretchy wool knit. I can't recall the exact composition of this fabric, but it definitely has some spandex in it. I just love the super-wide bottom band on this cardigan, it feels so decadent to make a band so wide, and it also gives the bottom of the cardigan a bit more weight and substance which improves the drape. I interfaced the bands with a lightweight knit interfacing, just to give them a touch of structure and to encourage my very stretchy knit to behave properly. I also put a strip of interfacing in the shoulder seam to prevent stretching. I followed the directions as written on this version, and everything worked out beautifully. I did have a bit of fun with this all black cardigan by binding the seams with a fun black and white lace print knit. I did all of the construction on the serger, except for the seam binding. 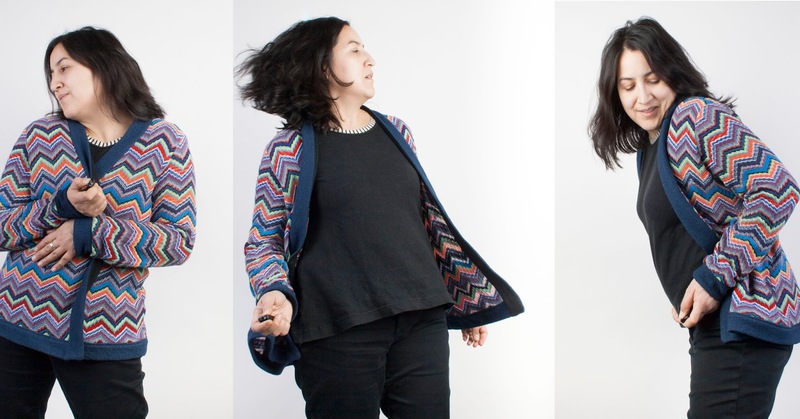 After wearing this cardigan a few times, I decided I wanted a bit more coverage in front-- my office is super drafty, so I like to be able to wrap the cardigan around me when I feel a bit of chill. I added about 1-inch in the center front, fading away to nothing at the neckline. The pink part is a sketch of the part that I added to the front pattern piece, and the gray is what I added to the bottom band. I made my second Blackwood from another wool jersey knit. This is a wonderfully soft wool knit, but it has only mechanical stretch (no spandex). So I also decided to do a full biceps adjustment-- Jenny at Cashmerette has a nice description of how to do this on her blog. I used a lovely wool ribbing for the bands... I have a couple of roll-end pieces from Emmaonesock that have been in my stash for years, and this was the perfect application for one of those pieces. 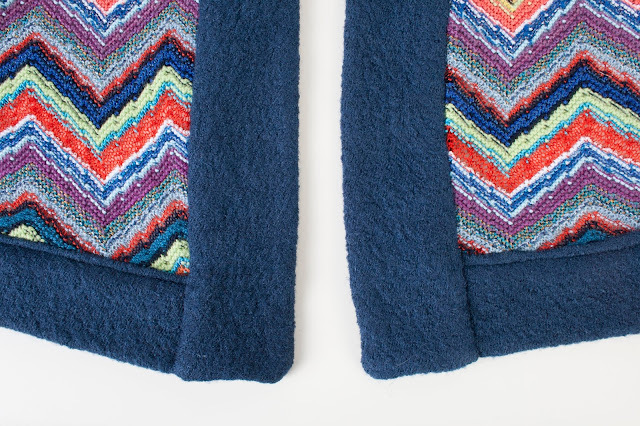 To show off this lovely ribbing, and to maximize coziness, I made the neck band the same width as the bottom band. 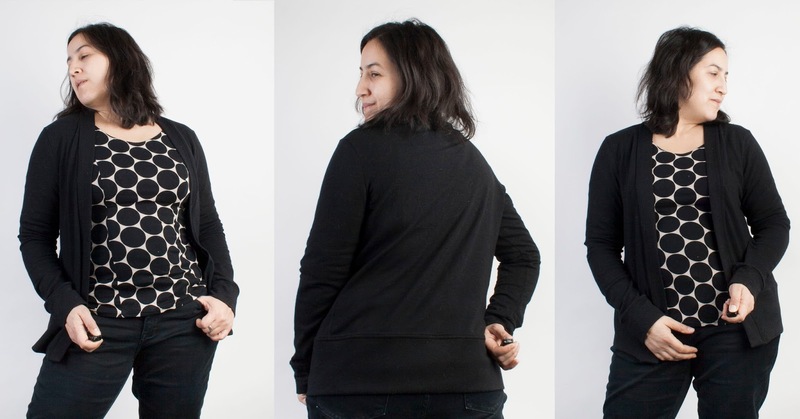 This simple change also really makes this cardigan look totally different from my first black cardigan. 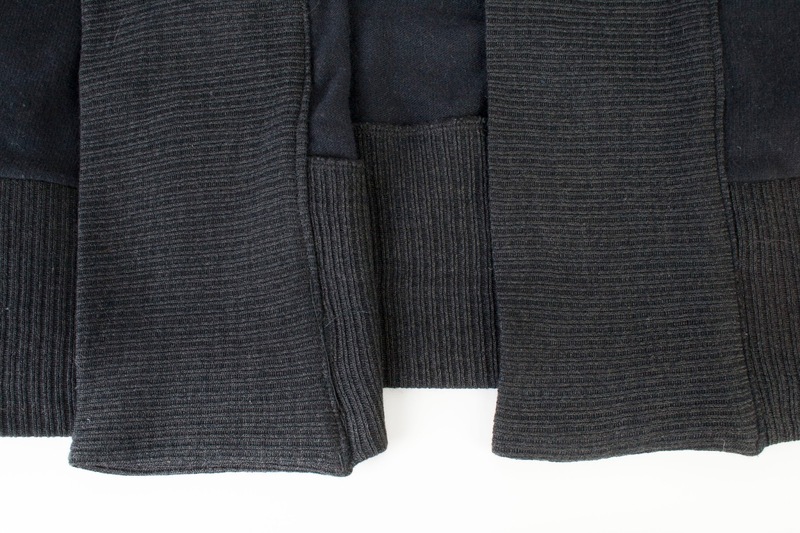 Attaching neck bands to cardigans is always a bit of a dilemma for me. I just hate to have that seam exposed, it looks so unprofessional to me. So on this cardigan, I decided to fold under the raw edge and top stitch it down. This is sort of hard to do neatly since you need to top stitch from the front side and catch that folded edge on the underside. I've tried various methods to keep that back side in line, including using tons of pins and wash away tape. This time I tried hand basting. The end result isn't perfect, but I still prefer it to a serged edge. This has become the cardigan I reach for on chilly days. So cozy, but the ribbing gives it a bit of structure so it doesn't look sloppy. I especially love the wide bottom band done up in the rib, it really accentuates this design detail. So, my next version I decided I needed to break up my black streak. I've had this lovely Missoni knit in my stash from Emmaonesock for awhile. 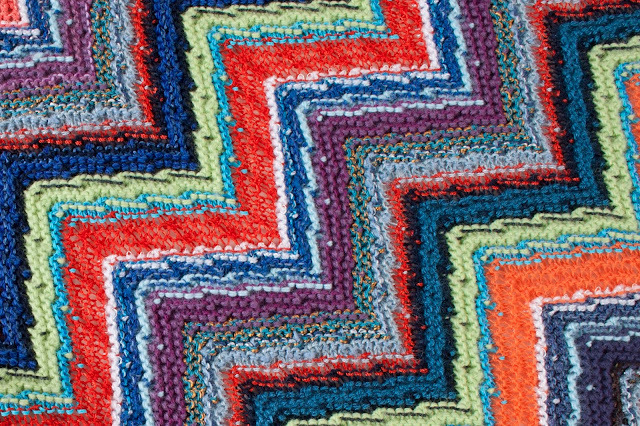 It is really quite lovely, mostly viscose with a bit of brassy sparkle, in a bold color scheme from the height of Missoni's chevron craze. I was thinking I'd make it into a dress, but I think it will get much more wear as a cardigan. This very special knit really needed a very special fabric for the bands. I definitely wanted a solid that would pull out and accentuate one of the colors in the fabric. Rayon ponte would be the obvious choice, but I've had some trouble with rayon pilling in hard wearing locations. Silk jersey would be decadent, but the price tag is pretty steep, and I'd also have to work out how to give it enough structure to not look floppy. I ended up going with a navy wool boucle from Emmaonesock. I just took a risk and ordered a yard, and the color was perfect but it was a bit thicker and a touch scratchier than I had expected. In a flash of inspiration, I remembered that I had some black silk jersey scraps from a previous project. Instead of cutting the neck band and wrist bands in a single piece and folding, I cut the pattern piece into two pieces and added a seam allowance to each piece. This allowed me to use the silk jersey on the inside of the bands, and the wool boucle on the outside. The two are perfect together... the wool provides structure and a beautiful color and texture, while the silk jersey reduced bulk and is wonderfully soft on the neck and wrists. For the bottom band, I just used the boucle folded over. 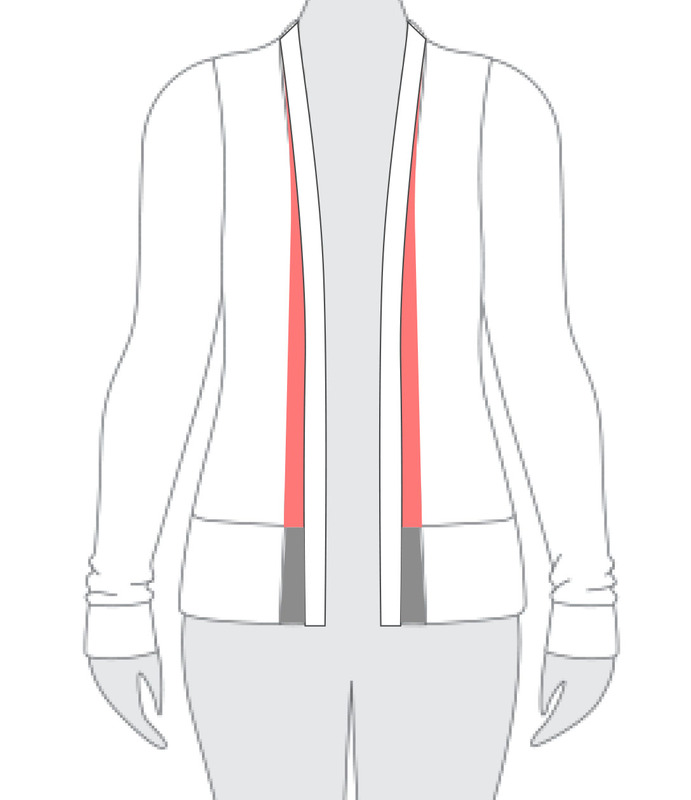 On this sweater, I decided to make the bottom band and the wrist bands the same width as the neck bands, and made the body of the cardigan longer to compensate. I should have made the sleeves longer to compensate also, but I forgot to do this. It turns out though that this crazy loose knit wants to grow, and the sleeves are plenty long. I went up a size for this cardigan, from a large to an XL. 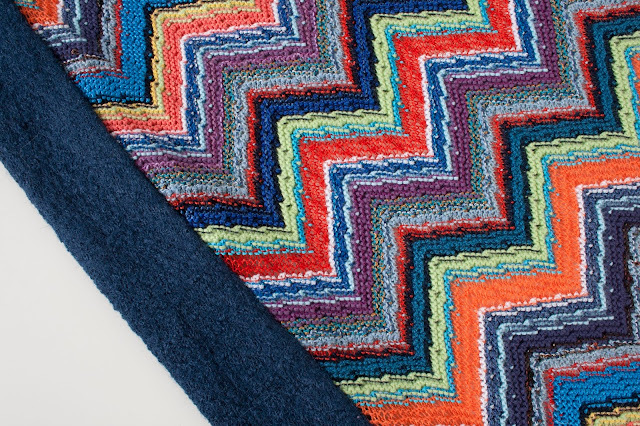 The Missoni knit is considerably thicker than the fabrics this pattern calls for, and while it is a loose knit, it doesn't have the kind of stretch and recovery that a knit with spandex has. I kept the shoulder width of the L though, since I thought this was perfect on me, and I didn't want the drop-shoulder look. However, I think there was also a bit of lateral growth when I was working with the pattern pieces, and I might have overcompensated, since it is a bit roomier than I expected. I may take it in a bit at some point, especially if it continues to stretch out, but a bit of extra room in a cardigan isn't such a bad thing. Since this is a very loose knit, I fused strips of bias-cut weft interfacing in the shoulder seams and the armhole seams to prevent the sweater from stretching out of shape over time. For finishing the bottom band and neck bands, I hand sewed the back of the band to the sweater. Hand sewing isn't my favorite thing, but I wanted a truly lovely finish on these somewhat fickle materials so I conceded gracefully. While it's not perfect, it is a fun piece to wear and it is both practical and luxurious. In my mostly dark-colored wardrobe, I enjoy having a few quirky garments that I pull out a couple times each season, and this definitely fills that role. 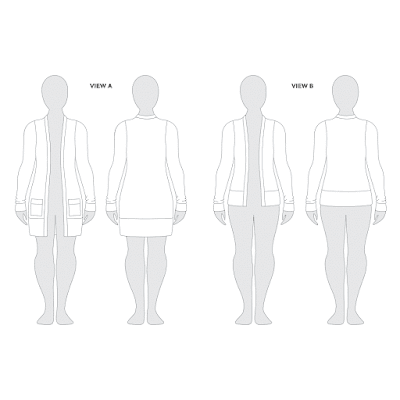 There you have it, one pattern resulting in three very different cardigans. The possibilities are endless... and I haven't even cracked open view A! Dear readers... how will you personalize your Blackwood? With special thanks to Helen, enter the Rafflecopter giveaway for the chance to win your very own PDF copy of the Blackwood Cardigan Pattern. The giveaway will be open until Sunday March 19th at 12am, and I'll contact the winner by email. I really like the cardigans that you made. I have never made one, but need one and never seem to find anything I like when shopping. I think I would try adding a floral patterned ribbon around the edges. Beautiful! I love your modifications! 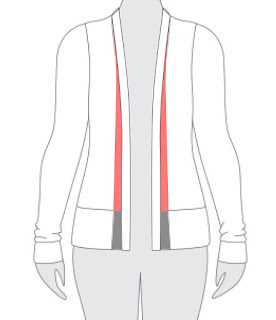 I would definitely make the neckband wider--I love that look now after seeing your version! Thank you for showing how you widened one of your versions! It's great to see how these little changes can make such a difference.